Looks like Google is to start pushing Currents again, as it just received a major update to version 2.0. 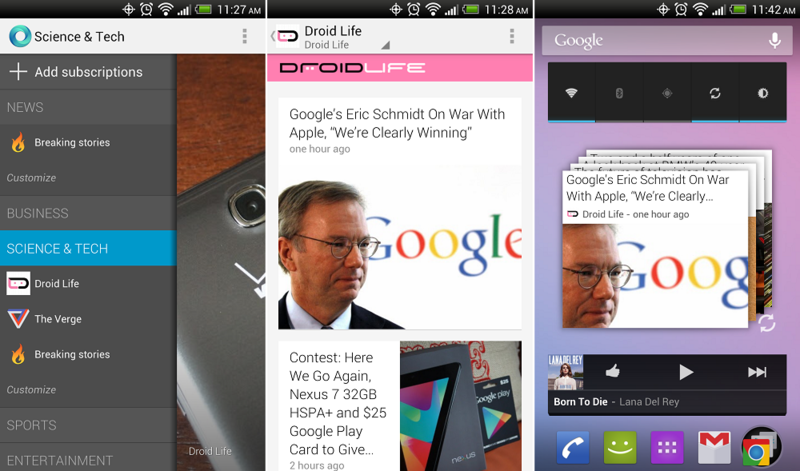 This year at Google I/O, they released an updated version of the news feeder app that brought Nexus 7 support and a basic redesign. This time, in 2.0, the entire app has been re-imagined and it’s much prettier than it was previously. Now, you go through your feeds by scrolling left and right, and go through stories by swiping up and down. There is a dedicated sidebar for quickly accessing other topics, as well as breaking news. To top it off, they have also added a widget that is reminiscent of the YouTube widget, where you scroll through stories. Overall, this update may actually get me back into using it. Try it out and let us know what you think. If you haven’t already, be sure to subscribe to Droid Life on Currents. We currently have over 250,000 subscribers.